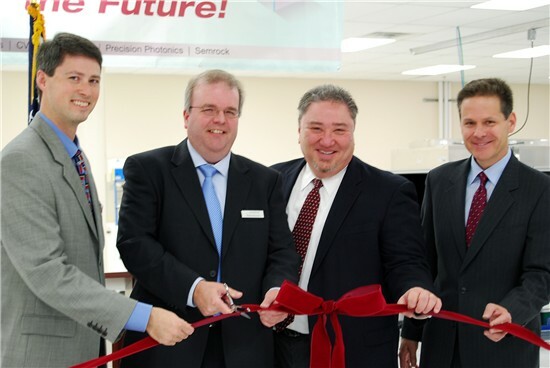 Rochester, NY –On October 16th Semrock held a ribbon cutting ceremony to reveal the expansion of their high volume factory. The morning began with Denis Lee, IDEX Optics & Photonics (IOP) Director of Global Supply Chain and Logistics, who was the event’s MC. Lee thanked those who were greatly involved in the process, including Judy Seil, Monroe County Planning and Development, Mark Assini, Gates Town, William Coe, EMCOR Services-Betlem, and building owner and event facilitator, George Pietropaolo. The morning’s presenters began with Dr. Michael J. Cumbo, President of IOP, who discussed how the expansion creates growth for Semrock and IOP. Following Dr. Cumbo was Rob Beeson, Semrock General Manager, who discussed what this expansion will mean for growth in Rochester Optics. Beeson also cited the driver behind the expansion, Dr. Craig Hodgson, Semrock Director of Research and Development who discussed his journey with the idea of the expansion and thanked those who helped make it a success. The presentation was wrapped up with a Q&A session followed by a media tour of the new facility. The event was celebrated by Semrock employees and media representatives, and refreshments were served. Semrock would like to thank all who attended and everyone who had a role in making this expansion happen. Semrock, Inc., a Unit of IDEX Corporation’s Optics & Photonics platform, manufactures optical filters that set the standard in performance and reliability for the biotech and analytical instrumentation industries, as well as innovative optical filters for more general laser and optical systems applications. All Semrock optical filters are made with hard ion-beam-sputtered optical coatings. OEM filters are manufactured in volume. End-users benefit from a wide selection of standard catalog products that ship from stock. Semrock’s patented and patent-pending products include its highly acclaimed BrightLine® fluorescence filters, state-of-the-art filters for Raman spectroscopy, and other unique filters for lasers and optical systems. Semrock’s innovative products, made possible by combining modern sputtered coating techniques with Semrock’s proprietary volume manufacturing technology, are covered under a five-year warranty.